Wham, glam, thank you, ma’am. One for the Marc Bolan collector, sure, but not necessarily the completist. There’s little room for doubting the Edsel label’s commitment to preserving the archive in public: this is a package as lovingly compiled as any eight disc (each tipping in at the 70 minute mark) sifting through the man’s dusty odds and sods has any right to be. But there’s no ignoring the fact that this is the third outing for this set, originally released as single discs in 2001 and as a limited edition collection in 2010, and now available as this smartly packaged 12″ set. It earns its place, however, amongst the by-now almost immeasurable T. Rex back catalogue by dint not of artful curating – much of what’s on offer here ranges from non-essential to bloody awful – but Bolan’s unique and mesmerising vision: even amidst the detritus, diamonds shine bright. So while his mutterings and pre-take comments are all fine and, um, dandy, it’s up to the songs to carry the load of this epic endeavor. The sketches intrigue but it’s the fully fleshed out (or close enough to it) recordings that best represent Bolan’s wayward genius. There are two takes on ‘Saturation Syncopation (All Alone’) and they’re both distinct enough to warrant inclusion, whereas an epic eight minute exploration of ‘Two Tone Lady (She’ll Be Good To Me)’ is a head-spinning and vital reminder that, when he was on it, boy was he on it. Essential? Nah. A valuable and unique, despite its ongoing re-packaging, slice of ephemera? Absolutely. 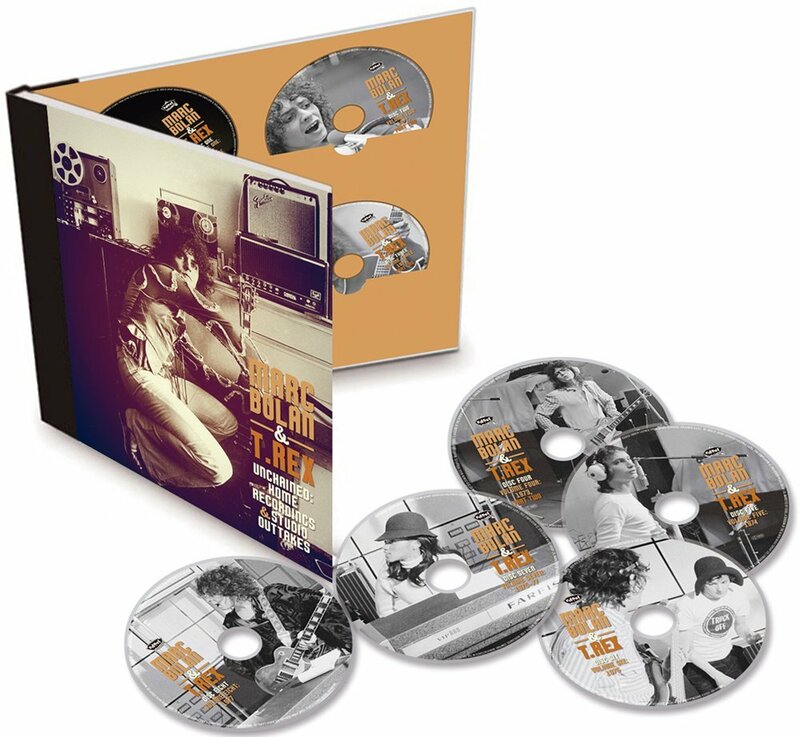 Whilst you are quite correct that this is the second time all eight discs have been issued as one package, you didn’t mention the principal reason for this re-release. The vast majority of the original run of the 2010 release was destroyed in the infamous Sony warehouse fire of 2011. This resulted in copies changing hands for upwards of £100, for what was a pretty basic package of discs in a card slipcase. Far from “cashing in”, the record company has done fans a favour by making these discs available again at an affordable price, and in a far superior package. The quality of the music on the discs does vary between the extremes, but there is enough good stuff on each disc to make this package a worthwhile purchase. Thanks for the clarification, Stuart – that fact wasn’t mentioned in any of the paperwork we received from the label.